November 2018 was a golden month with Disney fans all over the world celebrating a whooping 90 years of Mickey Mouse! Joining the celebrations, PANDORA produced a Limited Edition charm as part of the Winter 2018 Collection. 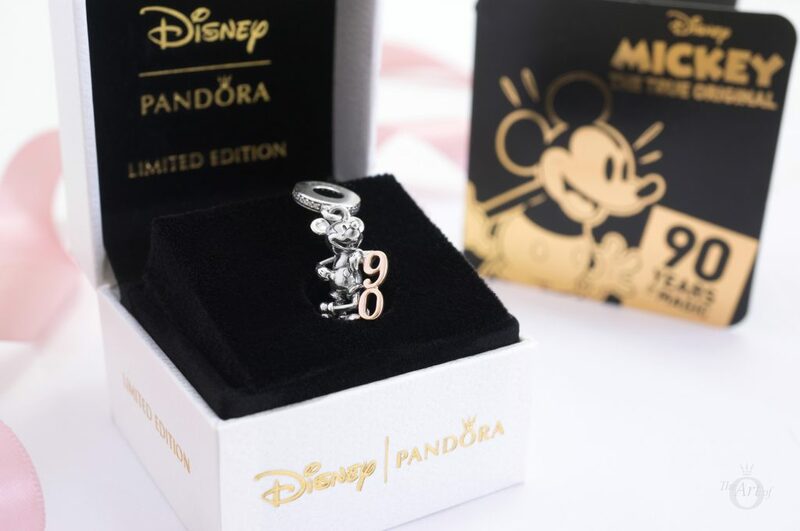 Hence, the commemorative PANDORA Disney Limited Edition Mickey’s 90th Anniversary Pendant (797497CZ) will be a significant piece for every Disney lover. Personally, it is especially meaningful to me as a reminder of my first visit to Walt Disney World earlier this year. 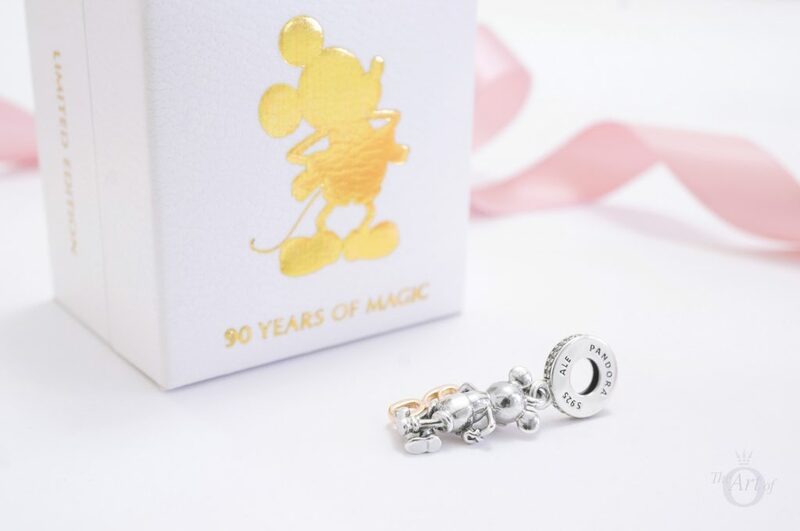 Presented in an exclusive gift box the PANDORA Disney Limited Edition Mickey’s 90th Anniversary Pendant (797497CZ) is an ideal gift for any Disney fan. Opening the box reveals both Disney and PANDORA logos glowing brightly against the black interior along with the words ‘Limited Edition’. 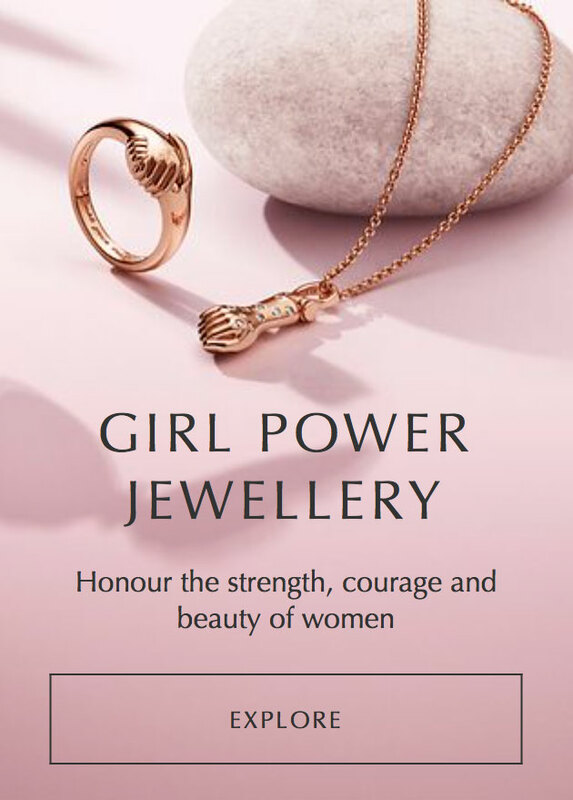 Also, as this celebratory pendant can be worn on both bracelets and necklaces, it is a wonderful introduction into the magnificent world of PANDORA jewellery. 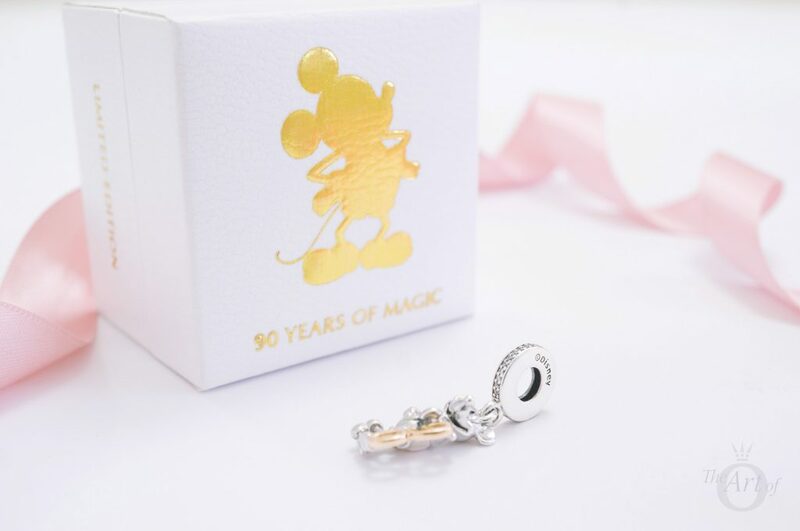 The white gift box is embossed with the title ’90 Years of Magic’ and fittingly decorated with a shining gold Mickey motif. Further, set on either side of the PANDORA Disney Mickey’s 90th Anniversary Pendant box are the words ‘Limited Edition’. Throughout the years Mickey has evolved but the PANDORA Mickey’s 90th Anniversary Pendant captures Mickey’s classic style. While dressed in his famous shorts, boots and gloves, Mickey looks happily to one side. Beautiful oxidisation emphasises the subtle details on Mickey’s clothing and his big smile. Despite his advancing years, Mickey looks young and sprightly as he casually leans against his big number. Because he looks so strong and animated (pun intended!) no one would think he was a 90 year old gent. Perhaps Mickey will receive a letter from the queen on his 100th anniversary in ten years time! 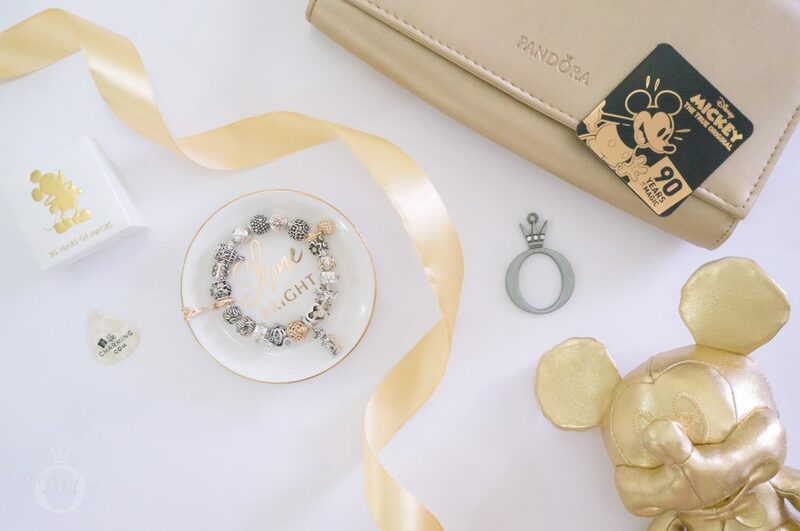 While some object to cubic zirconia, the glittering stones set on the bale do provide a glamorous touch to the Mickey’s 90th Anniversary Pendant. Also positioned on the silver bale are the ‘PANDORA’ and ‘S925 ALE’ hallmarks. While hidden inside the zero is the ‘G585’ hallmark for the 14k gold numbers. Also engraved on the opposite side of the bale is the ‘©Disney’ hallmark. 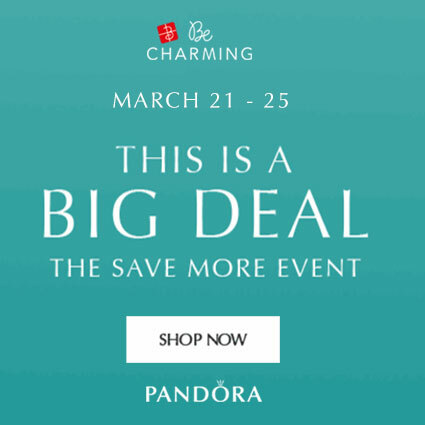 Because there are so many counterfeit charms for sale I would like once again remind readers to only purchase PANDORA jewellery from authorised retailers. Hence you will avoid disappointment and loss of money. 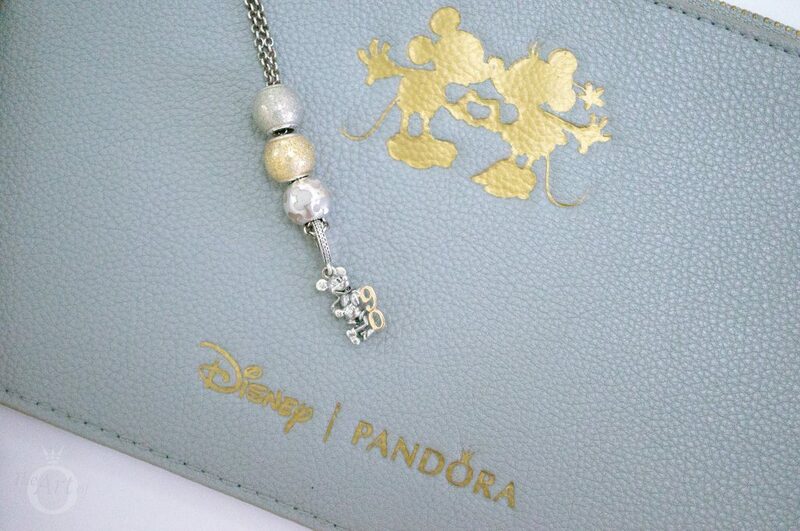 Finally, Mickey is equally charming viewed from the back of the PANDORA Disney Mickey’s 90th Anniversary Pendant. 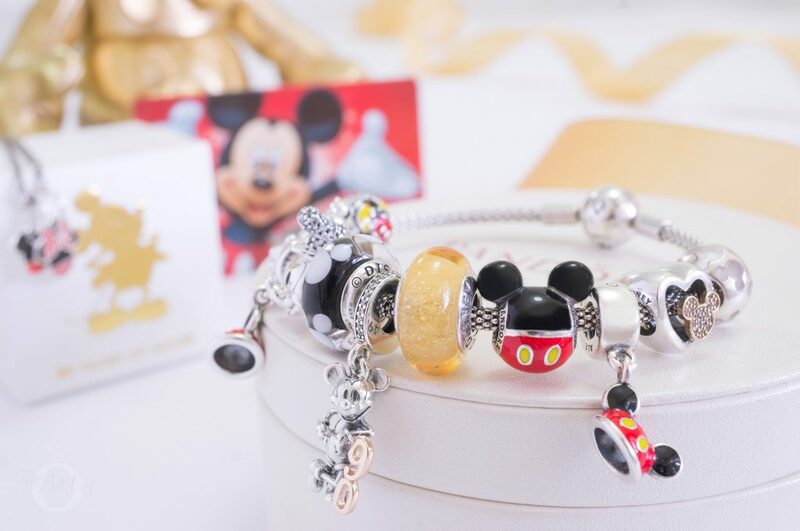 As a result of his vintage style, he is similar to the PANDORA Disney Climbing Mickey Safety Chain (797173CZR) and Mickey Love Heart (797168NFR) charm. 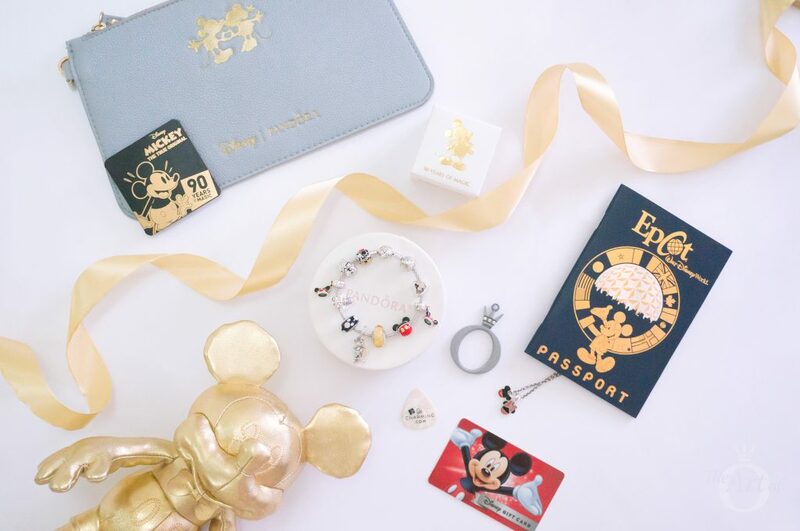 Even more Mickey magic can be found in our inspiring reviews of the Climbing Mickey Safety Chain and Mickey Love Heart charm. 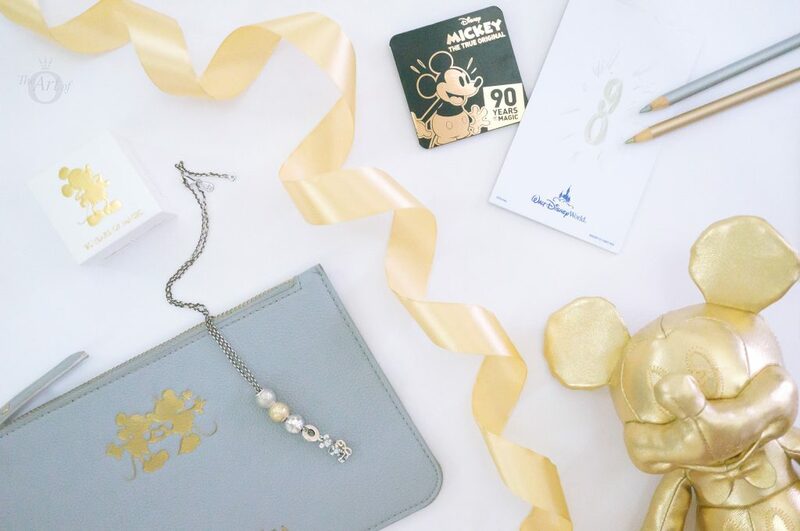 First we focus on Mickey’s golden years in a stunning gold and silver design with the PANDORA Disney Mickey’s 90th Anniversary Pendant. 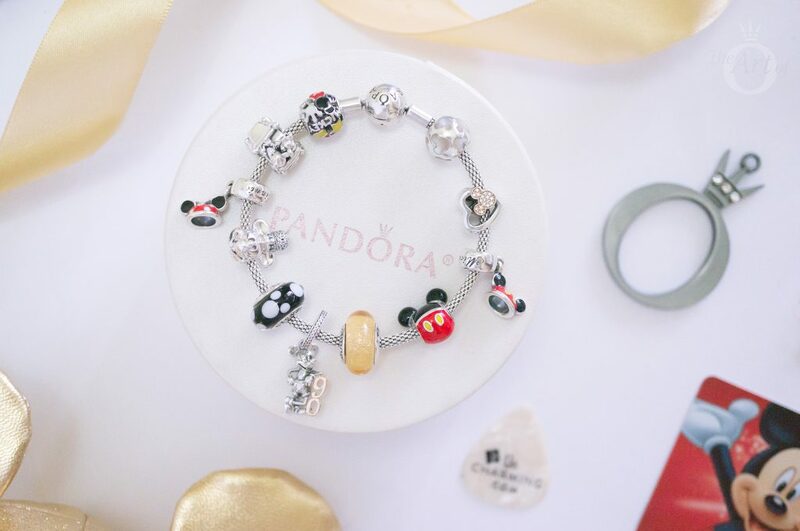 Due to being the mouse of honour, Mickey takes centre stage on the PANDORA Moments Mickey Bracelet (590731CZ). Further golden drops shine from the three two tone Disney charms along with the marvellous 14k Gold Celtic Circles (750811TPK) charm. Additional touches of gold glow from the tiny Mickey ears on top of the Disney Parks Carousel charm and the majestic crown on the dreamy Cinderella Pumpkin Coach (791573CZ). Another Limited Edition charm, the Mickey & Minnie Love Icon (796463CZ) snuggles alongside Mickey. As diamonds are traditionally given as gifts for 60th and 90th anniversaries I decided to scatter a few over this styling! Therefore, brilliant diamonds sparkle on both sides of the bracelet from the glorious 14k Gold Pavé Heart (750809D) and Eiffel Tower (750995D) pendants. 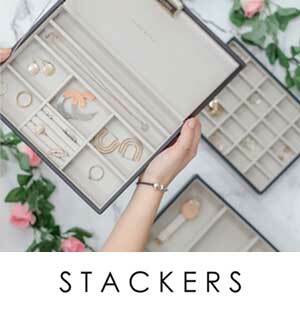 Like most PANDORA collectors, I prefer diamonds to cubic zirconia stones and I hope that PANDORA will reintroduce real gems in their designs in the coming year. 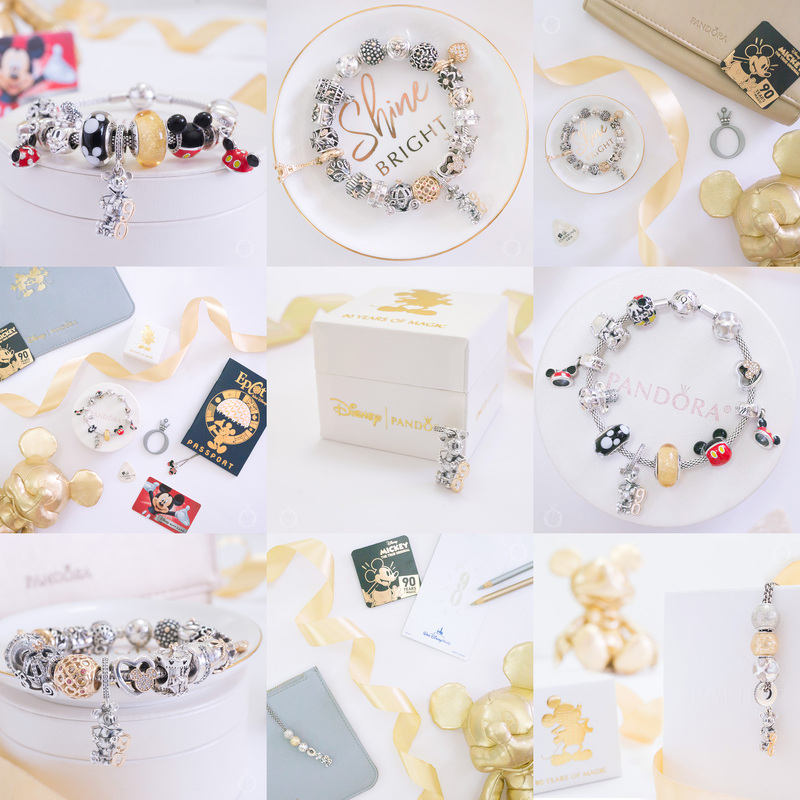 Further inspiration can be found in our dazzling review of the PANDORA Disney Mickey & Minnie Love Icon. 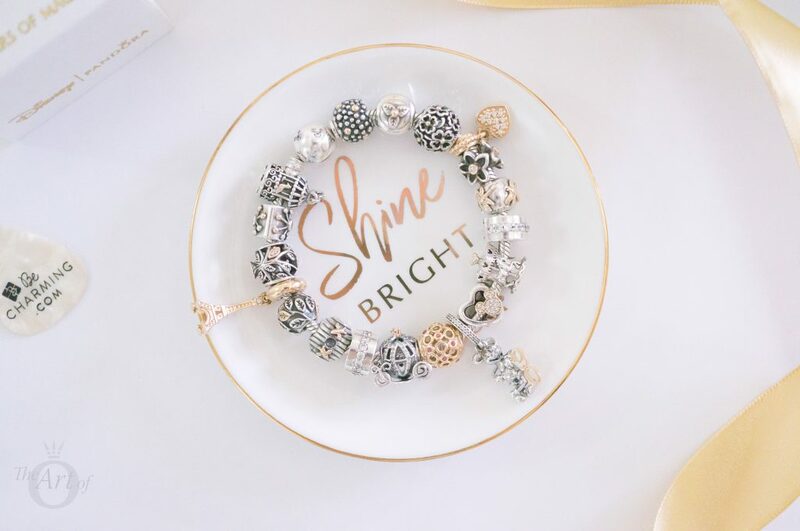 While charms look great on a bracelet, they don’t just have to stay on your wrist! 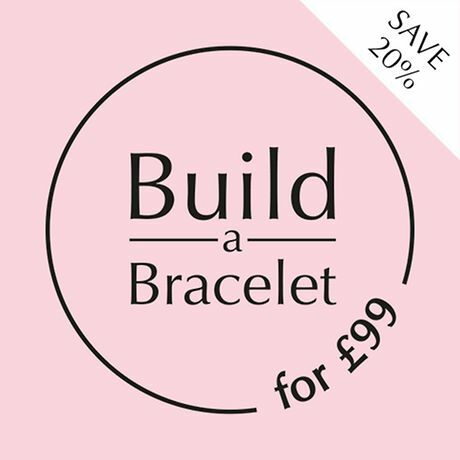 Because of their wonderful versatility, unlimited creations are possible with PANDORA jewellery. 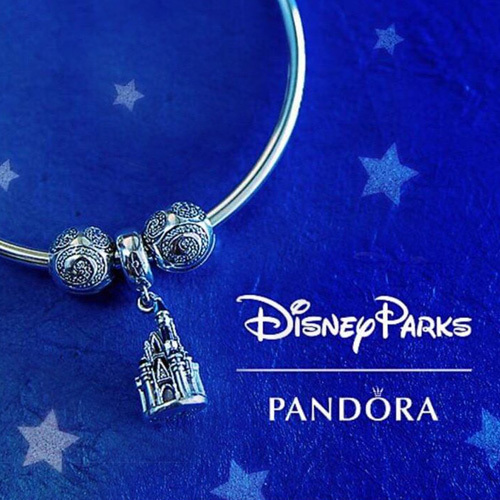 Noteworthy, this is shown in our second styling with the PANDORA Disney Mickey’s 90th Anniversary Pendant. While Mickey hangs handsomely from the classic PANDORA 45cm Necklace (590412), the Silvery (796327EN144) and Golden Glitter Ball (796327EN146) charms lend a festive air. Additional texture is provided with the luminous Pearlescent Mickey Silhouettes (791818MOP) charm. Finally, Mickey’s treasured 14k gold number 90 echoes the warmth of the Golden Glitter Ball in this beautiful mix of metals. 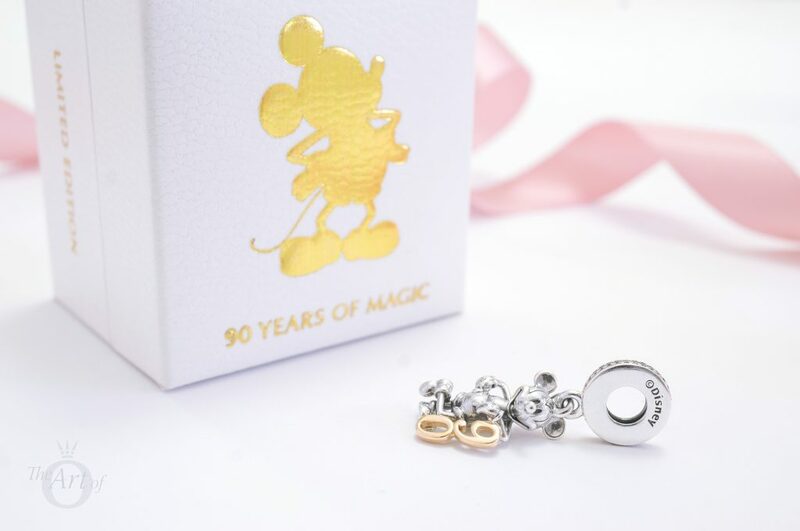 Finally, our last design with the PANDORA Disney Mickey’s 90th Anniversary Pendant is lively and fun, just like Mickey! With the Silver Mesh Bracelet (596543) as a background, this colourful styling illustrates Mickey’s history throughout the years. Representing Mickey’s first movies is the Shimmering Steamboat Willie Portrait (797499CZ). 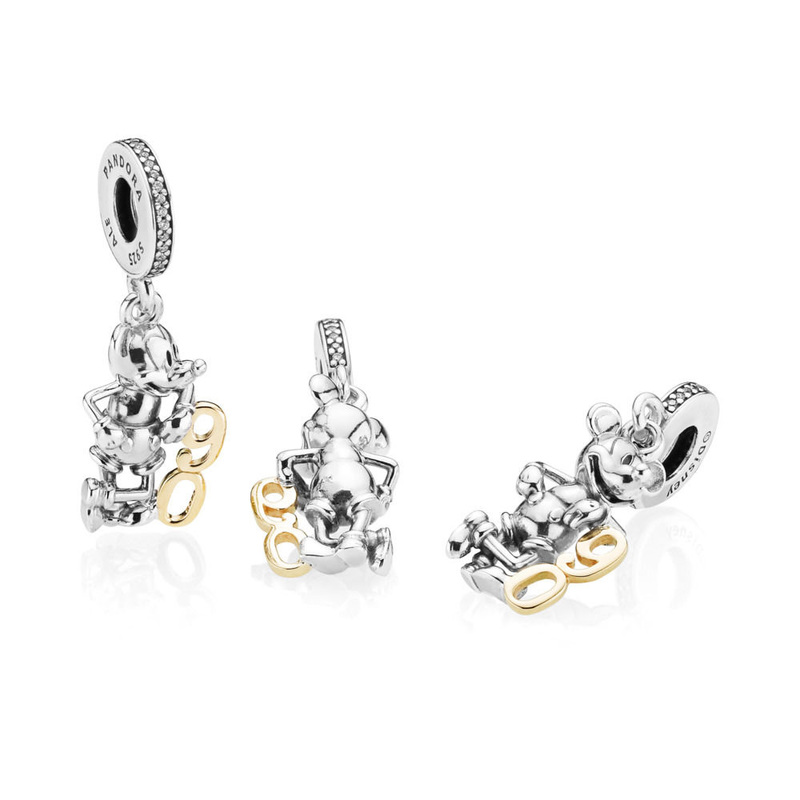 While Mickey’s early films in black and white are illustrated with the Classic Mickey Murano (791633) charm. Similarly, the bright and vivid Disney Parks Playful Mickey charm beautifully depicts Mickey’s first technicolour film in 1935. 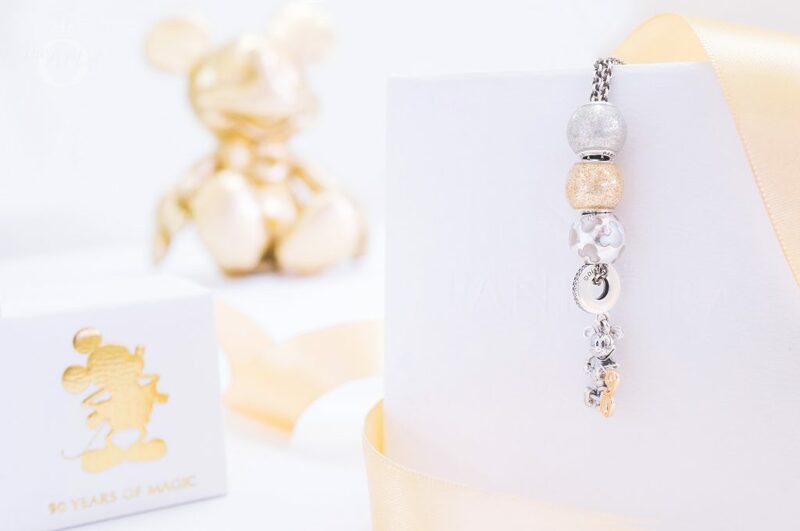 All 90 years of magic are celebrated with the golden yellow Belle’s Signature Colour Murano (791643) charm. In July 1955 Walt Disney built the first Disney Park in Anaheim, California. Further to the original Disneyland there are now a total of six worldwide Disney resorts and a total of 12 parks. 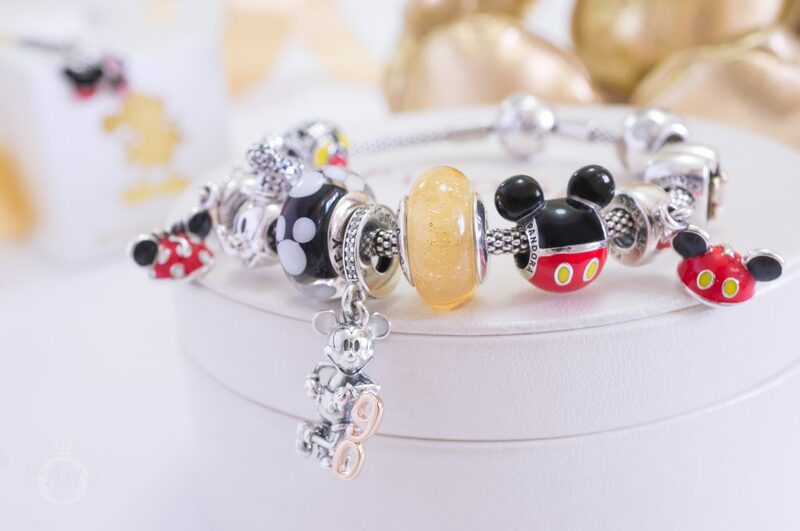 The adorable Disney Parks Mickey and Minnie Ear Hat charms represent the Mickey ears worn by Disney fans. 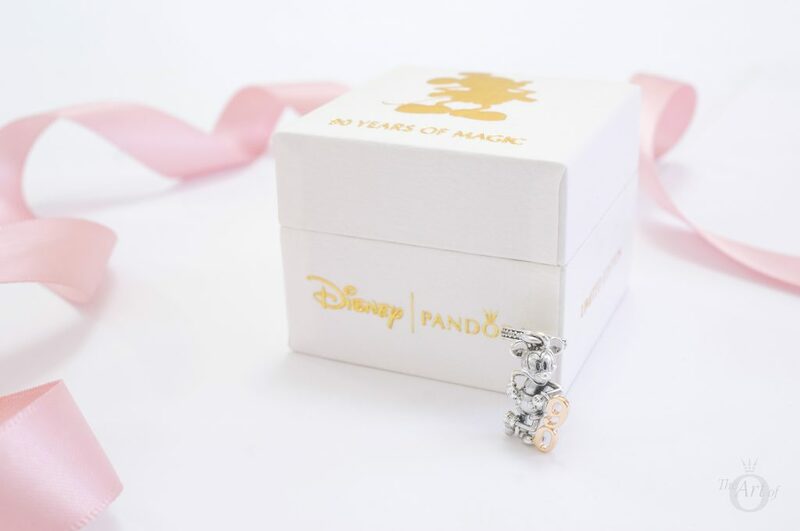 My verdict on the PANDORA Disney Mickey's 90th Anniversary Charm? Iconic! This fantastic charm deserves full marks. 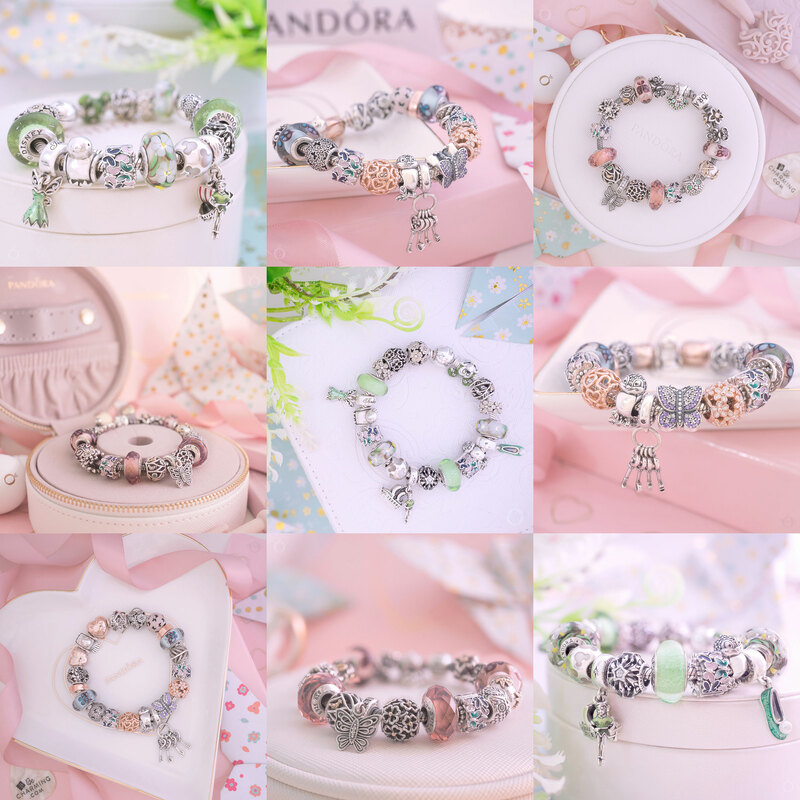 I am delighted that PANDORA are continuing to produce two tone charms and I look forward to seeing more of them in the future. 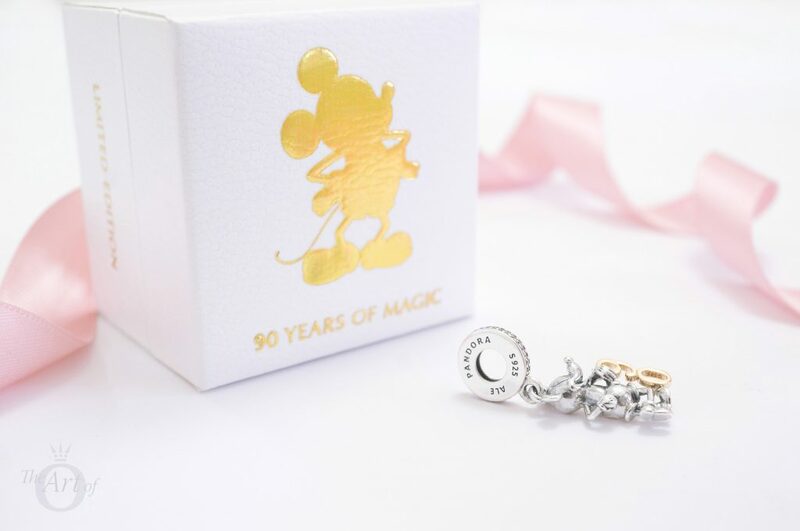 Some may feel that the Mickey’s 90th Anniversary charm is a little expensive. But I think it is quite reasonable considering large number 90 made from 14k gold. This special gold touch definitely adds to the wow factor and this pendant looks superb worn on either a bracelet or necklace. 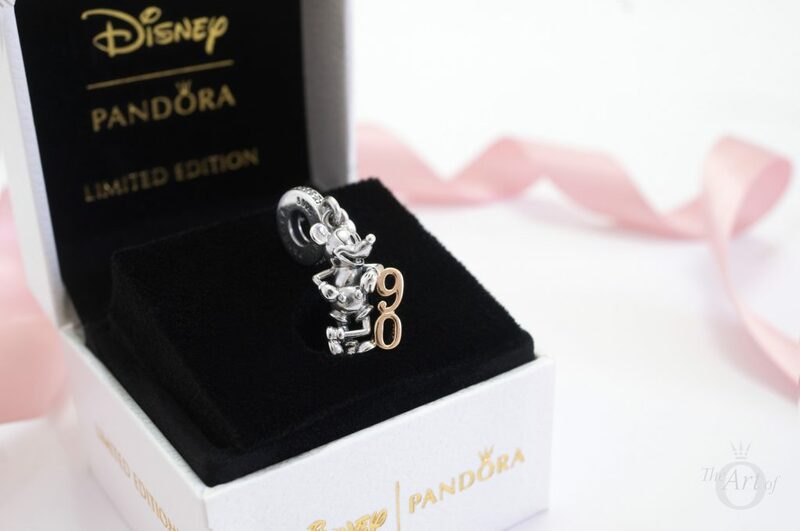 In the UK the PANDORA Disney Limited Edition Mickey’s 90th Anniversary Pendant Charm (797497CZ) is £90 and is available from the PANDORA UK eStore. Love the photos! I didn’t realize you had the gold Eiffel tower. I would love to see a review of it! Yes, my husband bought it for me a few months ago. But technically it’s an early Anniversary present for next year! Im planning a closer look at it next year when we take a trip to Paris. I purchased this lovely charm when it was first released on 1st November I love the charm so much and was well pleased to buy him. It’s a gorgeous charm isn’t it? How are you wearing yours? The mickey charm is so beautiful. The details are wonderful, not just the charm itself but the packaging too. The packaging does make it extra special. I love the packaging on the China exclusive Mickey 90th gift set too. Wow, another amazing post. I love this charm and the way you have styled it. Thank you for the comment. I’m glad you enjoyed the review. There will be more Disney reviews coming soon. I don’t understand why there are two tags associated with this charm: B801005 and 797497CZ ??? The 797497CZ code is its actual product code number, whereas B801005 is a gift set or box set code number. Often items that have a special presentation box or box sleeve have one of these numbers. I included it in the review as some websites will only have one of the two numbers so it can be beneficial to know both if you are looking for the charm. I hope that makes sense! 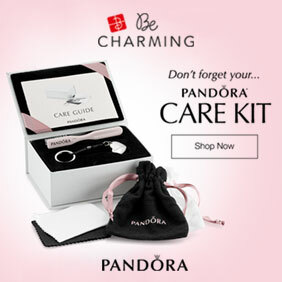 Makes perfect sense, explains why mine has the B801005 on the bottom as it was purchased with the special gift box and sleeve from a local Pandora retailer back in early November 2018 when it was first released. I LOVE IT!!! And it’s the most expensive charm I own but, it was worth it! It is a very beautiful charm. How do you style yours?